The 47 metre superyacht Ariadna is listed for sale with Imperial Yachts. To celebrate all that this luxury yacht has to offer, we bring you 5 reasons why you’ll want to buy Ariadna. Built by Heesen and designed by Omega Architects, Ariadna’s Dutch pedigree makes her a reliable vessel, and one that will serve a new owner for many years to come. With classic lines and a high level of maintenance that has kept her in pristine condition, Ariadna’s new owner will get a yacht that is as good as new. And thanks to her classic good looks, she’s a superyacht that won’t look dated any time soon. 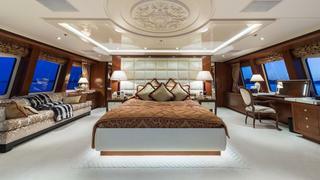 The 47 metre superyachtAriadna is listed for sale with Imperial Yachts. To celebrate all that this luxury yacht has to offer, we bring you 5 reasons why you’ll want to buy Ariadna. Built by Heesen and designed by Omega Architects, Ariadna’s Dutch pedigree makes her a reliable vessel, and one that will serve a new owner for many years to come. With classic lines and a high level of maintenance that has kept her in pristine condition, Ariadna’s new owner will get a yacht that is as good as new. And thanks to her classic good looks, she’s a superyacht that won’t look dated any time soon. Ariadna is a great example of how a yacht can feel sporty at sea. Her cruising speed is 12 knots, but there’s more to feeling sporty than speed – she manoeuvres well and is responsive on the water. Meticulously cared for since her 2011 delivery, Ariadna is propelled by her two diesel MTU V8 engines to a top speed of 15.5 knots and has a range of 3,000nm at 12 knots. Ariadna has completed her Lloyds five-year survey, which is another appealing point for a new owner. Furthermore, this superyacht is available for the Voluntary Certificate of Compliance. This means she is built as a commercial yacht but used privately - it would only take a few hours to change her to commercial status by modifying her COBR. 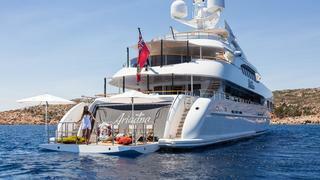 Ariadna is a great example of how a yacht can feel sporty at sea. Her cruising speed is 12 knots, but there’s more to feeling sporty than speed – she manoeuvres well and is responsive on the water. Meticulously cared for since her 2011 delivery, Ariadna is propelled by her two diesel MTU V8 engines to a top speed of 15.5 knots and has a range of 3,000nm at 12 knots. 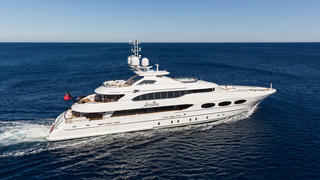 Ariadna has completed her Lloyds five-year survey, which is another appealing point for a new owner. 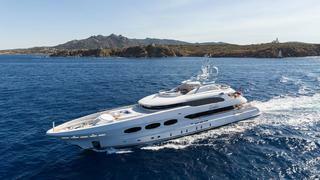 Furthermore, this superyacht is available for the Voluntary Certificate of Compliance. This means she is built as a commercial yacht but used privately - it would only take a few hours to change her to commercial status by modifying her COBR. The interior of Ariadna is equally as impressive. She features opulent touches and a range of textures such as the intricate gold patterned sofas, textured walls, golden cushions, silk panelling and plush furnishings. Ariadna has many highlights, such as a wide saloon and a dining table that can seat 10 and an on board cinema, but her full-beam owner's cabin is particularly special. It takes over the bridge deck, and has its own wide teak deck and a ceiling TV that can be turned into an outdoor cinema. Inside, the owner's suite boasts a huge bed with a silk headboard, a desk facing out with views over the water and a sofa on the opposite side. It's not just the owner's suite that impresses - Ariadna was designed with a two-master layout, which means she has an equally impressive VIP cabin and is particularly appealing to the charter market. The en suite bathrooms feature marble with gold fixtures and fittings and both a bath and double shower. Ariadna accommodates 12 guests in six cabins, made up of a master suite, three double cabins and a twin on the deck below. The interior of Ariadna is equally as impressive. She features opulent touches and a range of textures such as the intricate gold patterned sofas, textured walls, golden cushions, silk panelling and plush furnishings. Ariadna has many highlights, such as a wide saloon and a dining table that can seat 10 and an on board cinema, but her full-beam owner's cabin is particularly special. It takes over the bridge deck, and has its own wide teak deck and a ceiling TV that can be turned into an outdoor cinema. Inside, the owner's suite boasts a huge bed with a silk headboard, a desk facing out with views over the water and a sofa on the opposite side. It's not just the owner's suite that impresses - Ariadna was designed with a two-master layout, which means she has an equally impressive VIP cabin and is particularly appealing to the charter market. The en suite bathrooms feature marble with gold fixtures and fittings and both a bath and double shower. Ariadna accommodates 12 guests in six cabins, made up of a master suite, three double cabins and a twin on the deck below. One of the reasons you’ll want to buy Ariadana is because she comes with a number of fun toys to maximise your enjoyment of the yachting lifestyle. As well as two tenders, she also boasts two Seadoo jet-skis, two seabobs and two Jet Surf GT100s, giving guests the chance to zoom around on the water. She also has a flyboard, for those who want to impress, as well as paddle boards, a range of towables and inflatables and snorkelling equipment, which means there’s are plenty of watersport options to suit a wide range of guests. And, like most of the great modern superyachts, Ariadna has an impressive beach club. The garage door folds down into a bathing platform which has plenty of space to set up chairs or place the toys. One of the reasons you’ll want to buy Ariadana is because she comes with a number of fun toys to maximise your enjoyment of the yachting lifestyle. As well as two tenders, she also boasts two Seadoo jet-skis, two seabobs and two Jet Surf GT100s, giving guests the chance to zoom around on the water. She also has a flyboard, for those who want to impress, as well as paddle boards, a range of towables and inflatables and snorkelling equipment, which means there’s are plenty of watersport options to suit a wide range of guests. And, like most of the great modern superyachts, Ariadna has an impressive beach club. The garage door folds down into a bathing platform which has plenty of space to set up chairs or place the toys. There’s as much fun to be had on Ariadna’s outdoor spaces as there is inside or on the water. The space on her main deck bow presents a private sunbathing area with large sunpads and space for eight to dine alfresco and uninterrupted. Above, a spacious sundeck surrounds the superyacht. The roomy area aft has a table for 10 and a bar in the middle perfect for entertaining guests. Most exciting of all is her Jacuzzi and waterfall, flanked by sun pads, that faces the sea. Wherever you choose to relax on Ariadna, you’ll find there’s plenty to be enjoyed and this is perhaps one of the biggest reasons to buy this superyacht. There’s as much fun to be had on Ariadna’s outdoor spaces as there is inside or on the water. The space on her main deck bow presents a private sunbathing area with large sunpads and space for eight to dine alfresco and uninterrupted. Above, a spacious sundeck surrounds the superyacht. The roomy area aft has a table for 10 and a bar in the middle perfect for entertaining guests. Most exciting of all is her Jacuzzi and waterfall, flanked by sun pads, that faces the sea. Wherever you choose to relax on Ariadna, you’ll find there’s plenty to be enjoyed and this is perhaps one of the biggest reasons to buy this superyacht.